On the same day that we announced the HP acquisition, Tabblo launched a new product that got a little lost in the commotion. 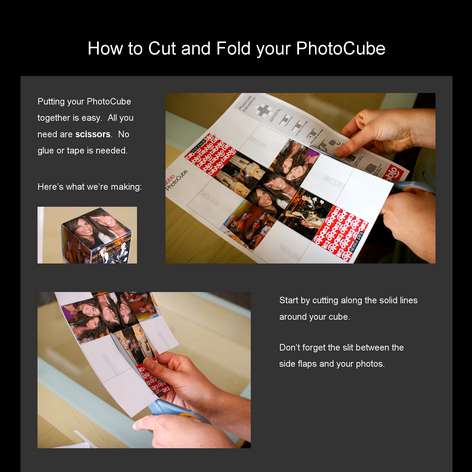 The Tabblo PhotoCube is our first print-at-home product: it’s a five-photo cube that you print yourself, cut out, and fold together. It was a lot of fun to launch. I did the paper engineering. The challenge was to find a way to construct a cube that wouldn’t require tabs and glue, but would hold together well enough to feel satisfying when you’re done. My first attempt was an interesting construction, but required a PhD in folding to put together. The final result is simple enough to explain that people seem to have no trouble putting it together. The compromise is that there are only five photos, the bottom of the cube is open. I like the result. It’s free, and it uses your photos, and although it’s a physical product, it has an immediacy that ordering books from us doesn’t have. 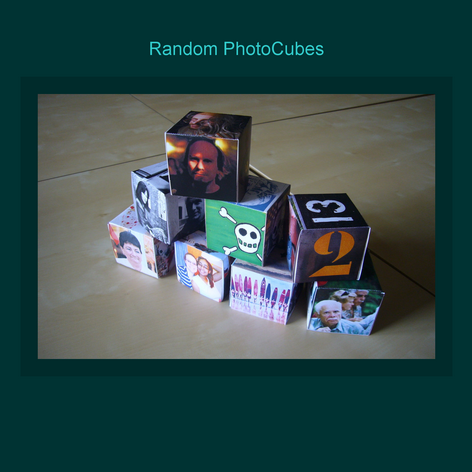 The PhotoCube nicely combines Tabblo’s emphasis on telling stories with your photos, with the matter transporter nature of paper models on the internet. I love these things! I also love your business card cube you posted a while ago. Just one question, what are the chances of more complex objects? I have a pattern for making a sturdy 12 sided ball out of three sheets. Granted this would require having pentagram shaped pictures which tabblo does not (yet?) support. More complex shapes are, well, more complex! With this photo cube, we were definitely aiming for simple to make, both in terms of process and tools. Going to other shapes, especially non-rectangular shapes, will involve a lot of work both for us in the editor and PDF generation, and for the customer. But... now I want to see the original foldey version you came up with. I totally want to see foldeys for simple oragami shapes that have lots of open spaces like the wings on a standard swan, or panda (although that's 2 pieces of paper). It would be really cool to have a whole line of 1 sheet oragami tabblo "foldeys". Very nice! Have you notified Seth Godin? Can you chat about how it was decided to use the WikiWord naming convention for the PhotoCube? masukomi: Maybe I'll post the original cube design. It was really complicated, cutting a sheet into three pieces, and the result was not that satisfying. DeanG: I'm intrigued by the possibility that Seth Godin might be interested, though I don't see the connection. As to the name, it's not like we had a big focus group or anything. Antonio said, "called them PhotoCubes", and we did! re: ink dept. being happy. That was another reason I suggested doing other oragami things, in addition to it just being fun. The ramifications of this HP aquisition are really interesting. Yes Tabblo will still make most of it's money from print on demand stuff but now there's all the indirect revenue they can start bringing in to HP just by giving people cool things to print. The only problem with that being that they can't let HP forget about that indirect revenue they'll be helping to bring in. I wouldn't be surprised, or bothered, if we didn't start seeing some HP encouragements in the empty space around the cube. Imaging how cool it would be to have the subliminal association of "this cool cube i just made" with HP brand ... even better, Imagine what would happen if you put a link on the page that said "Want to see how spectacular this could look an a HP(some model name/number) ? " which goes to a tabblo page where the person can enter their shipping address and HP would send them a free copy of the cube printed on whatever model it was they were trying to promote. Yeah it wolud cost a stamp, envelope, and someone's time to stuff them but I would imagine the resulting sales of ink for said new printer would be worth it. Limit it to one per customer per model promotion. masukomi: that's pretty interesting speculation, and I am as interested as anyone else (probably more!) to see where this acquisition takes us business-wise.